In the sky above ESO's La Silla Observatory, the Southern Cross is clearly visible just to the right of the dome of the Danish 1.54-metre telescope, and to the lower right of the image, two stars sparkle in the amazingly dark sky. From right to left, these are Alpha and Beta Centauri. Alpha Centauri is a multiple star, the nearest star system to Earth. A little closer to Earth than the bright components of Alpha Centauri, and invisible to the naked eye, is Proxima Centauri, the third star belonging to this multiple star system. It is our closest neighbour, at a distance of just 4.2 light-years. Previous observations have provided tantalising, but subtle, hints of a small companion orbiting this red dwarf star. 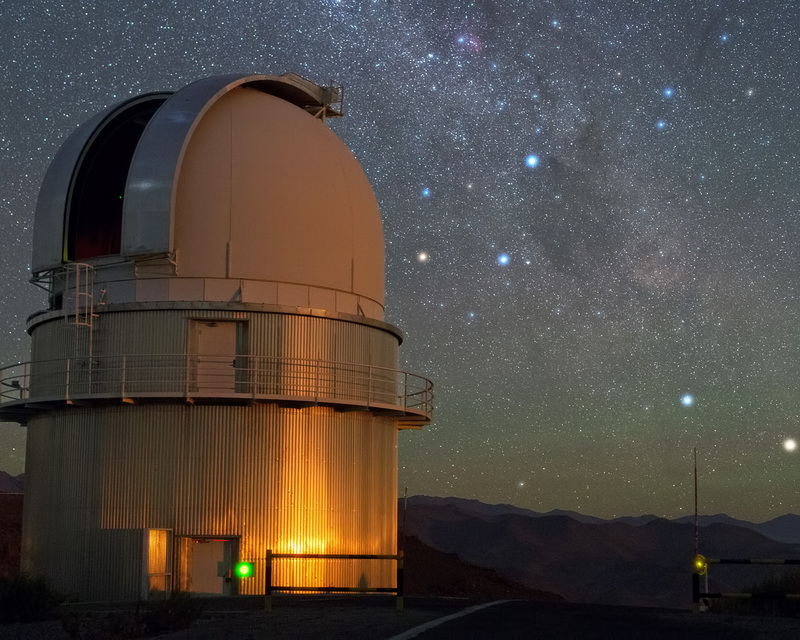 An observing campaign that started in January 2016 will make a more sensitive search for the telltale wobbles in the dwarf star’s orbital motion that might reveal the presence of an Earth-like orbiting planet: the Pale Red Dot campaign. 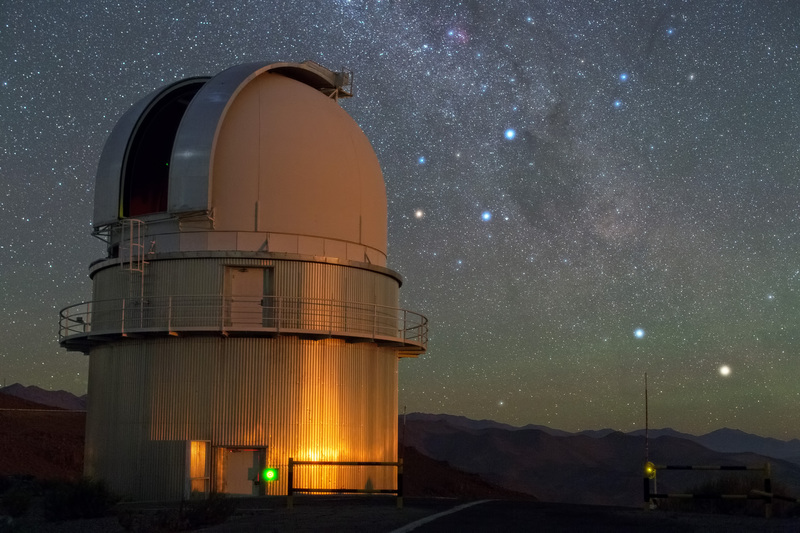 HARPS, the High Accuracy Radial velocity Planet Searcher instrument, which is attached to ESO’s 3.6-metre telescope at La Silla will be used to search for a potential new planet. Measurements with HARPS will be complemented by observations at the Las Cumbres Observatory Global Telescope Network (LCOGT) and the Burst Optical Observer and Transient Exploring System (BOOTES). As well as giving the public the chance to follow the scientific observations as they arrive, the Pale Red Dot outreach campaign will reveal the often unseen side of planet hunting in background articles and through social media. An array of blog posts on many topics — including planet-hunting techniques, ESO’s European Extremely Large Telescope (E-ELT), and the lives of stars — are planned. 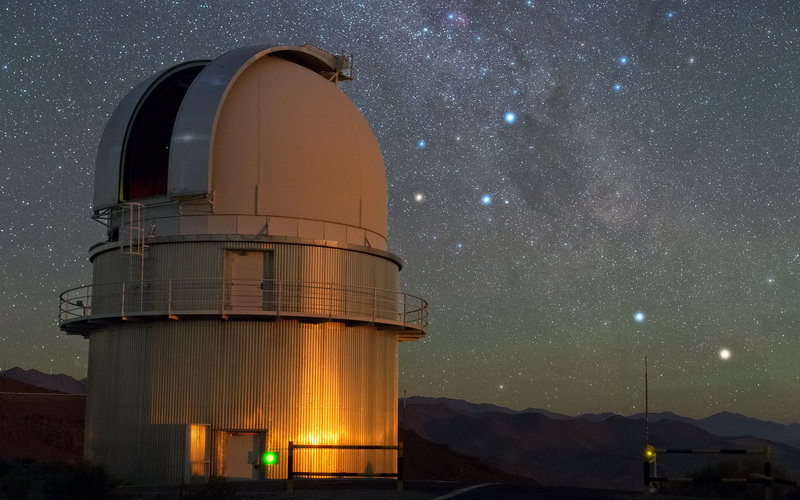 They will be written by the astronomers, scientists and engineers from the observatories involved, as well as by science writers, observers and other experts in the field.